Create a beautiful Christmas tree as a perfect holiday centerpiece – it’s easy and fun! Just bake, stack and decorate. 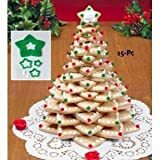 Kit includes 10 plastic star cookie cutters in graduated sizes from small to large, 3 disposable decorating bags, round decorating tip, cookie and icing recipes, baking and decorating instructions.